Three combination locks can be cracked without the code. This is helpful if you have a Master Lock or another three combination lock you have forgotten the code to. Trying random combinations would take 65,000 tries before finding the right combination. The following method will give you 100 possible combinations to try, one of which will open your lock. Set the dial at '0' and pull the lock taut. Start slowly turning the lock clockwise; stop when the lock gets caught on a number. This number can be a whole number, such as 3, or a half number, such as 6 1/2. Write down the number it sticks on and stop pulling on the lock. Pull the lock taut again and repeat the process until you've gone around the dial, writing down every number the lock catches. At the end you should have no more than 12 numbers. Five of these numbers will be whole numbers. Four will be decimals such as 12.5 -- these four must have the same ending number, for example 12.5, 6.5, 2.5, and 21.5. The only number with a different ending is the third number in the combination lock. If all the ending numbers are .5 except for a .3, 3 will be your third number in the combination. Divide the number you found to be the third combination number by four. If the third number in the combination lock is '8' the product will be '2'. If your product has a remainder, write that number down; if you have no remainder write down '0'. Your original remainder can only be zero, one, two, three or four. 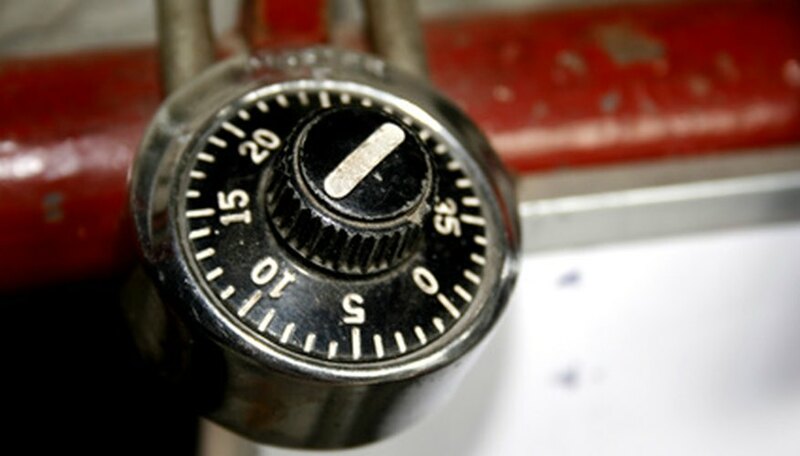 Add four to your remainder until you reach the highest number on your combination lock. So if you had a remainder '2' add four until you get to the highest number, e.g., 2, 6, 10. Out of these ten numbers one will be the first number in your combination lock. If your original remainder was a zero or one add two to the remainder making it two or three. If the remainder was a three or four, subtract two, making it a one or two. Starting with your added or subtracted remainder, if you had three, start with one and add four until you reach the highest number on your combination lock. If you don't hit the number perfectly that's fine just don't go over. Out of these ten numbers, one will be the second number in your combination lock. You now have 100 possible combinations. Use the trial and error method until you find the right combination. This method is better suited while your sitting somewhere comfortable and relaxed rather than in between classes when you forgot the combination to your locker. Never try to open a lock that doesn't belong to you; doing so is illegal.